This recipe is mostly protein and fat. Enjoy a slice with a side of carbohydrates (like Vanilla Mint Berry Fruit Salad or a piece of whole grain toast) for a balanced meal. Preheat oven to 350ºF. Beat eggs and egg whites together in a large bowl. Season with pepper. In a non-stick skillet lightly coated with cooking spray, add minced garlic, red pepper, mushrooms, zucchini, and broccoli. Sauté vegetables over medium heat until slightly tender, about 5-10 minutes. 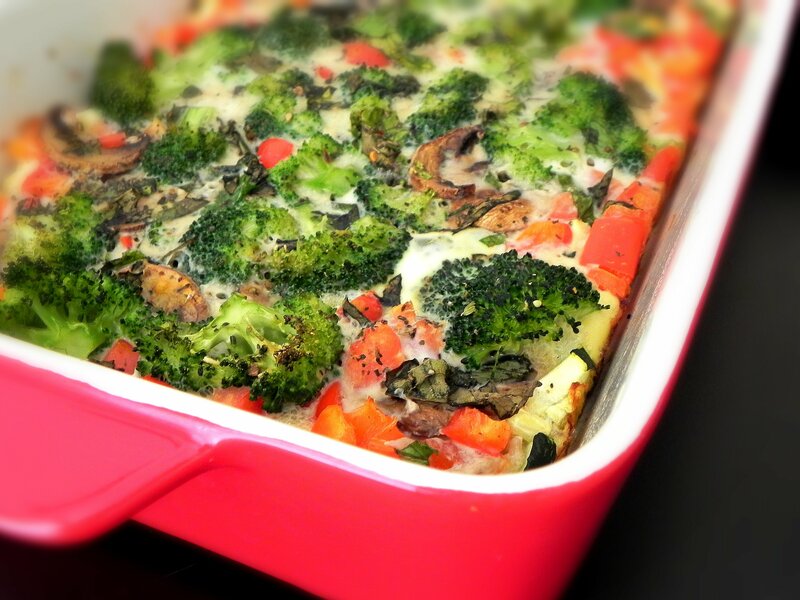 Add cooked vegetables, tomatoes, and herbs to a greased casserole dish or 8×8 inch baking pan. Top vegetables with eggs. Bake in oven for 35 minutes. Top with cheese and place back in the oven for 3-5 minutes or until cheese melts. Cut into 4 equal sized servings. Serve with hot sauce or salsa if desired.